House Majority Leader Mark Norris speaks about the conclusion of the legislative session at a news conference at the state Capitol in Nashville, Tenn., on Thursday, April 23, 2015. 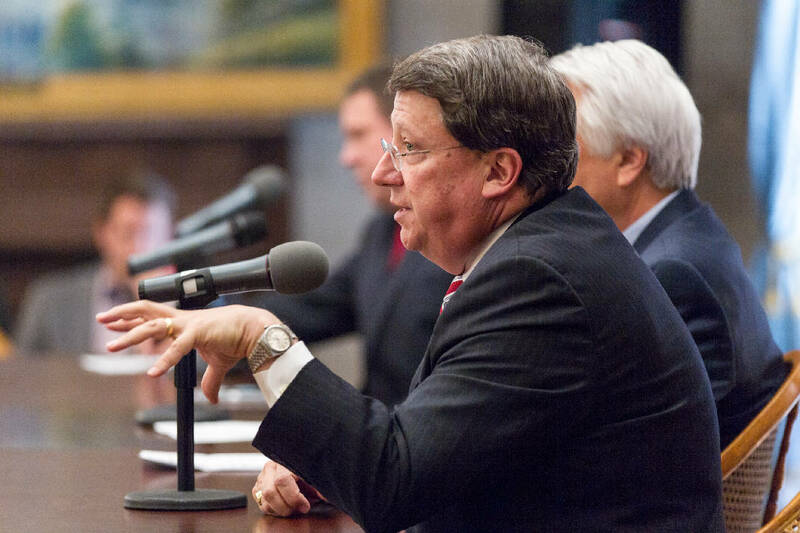 NASHVILLE — In a move that shakes up Tennessee's 2018 GOP primary race for governor, President Donald Trump on Thursday nominated state Senate Majority Leader Mark Norris, R-Collierville, to fill one of two U.S. District Court vacancies in West Tennessee. Norris had been gearing up for an expected race for governor until mid-spring when the Trump administration began seriously considering him for the vacancy and later began vetting him. Norris never officially announced he was running for governor and in recent months had stopped visible activity related to the contest. "I am honored by the nomination and appreciate the President's confidence in me. This is just the first step under the Constitution, and I look forward to the Senate confirmation process. In the meantime, I will continue to serve the citizens of the 32nd District who elected me to the Senate and my Senate colleagues who elected me as their Leader," Norris said in a news release. U.S. Sen. Lamar Alexander, R-Tenn., said in a news release Thursday afternoon that Norris "has served the state of Tennessee in public office – as a state senator and currently as the Senate Majority Leader – and has also practiced law for over 30 years working as a litigator in the trial and appellate courts, including the Sixth Circuit Court of Appeals and the United States Supreme Court." Alexander said "Tennessee will be well-served by a man of such good character and good temperament, and I look forward to introducing him to members of the Senate Judiciary Committee." Trump also nominated Tommy Parker to fill a second U.S. District judgeship in the Western District of Tennessee. "Since he graduated from Vanderbilt University School of Law, Tommy Parker has been one of the finest attorneys in Memphis – including nearly a decade of service as an Assistant U.S. Attorney for the Western District of Tennessee – and I am confident he will be an equally effective judge. I look forward to introducing him to members of the Senate Judiciary Committee, and I hope the Senate will quickly consider his nomination," Alexander said in a news release.